Mortgage Lender licensing requirements vary by jurisdiction. Although the majority of States only require lenders to be licensed for the purpose of issuing loans to borrowers for 1-4 family residential properties, a few States, such as Florida and California, require licensing for commercial properties as well. When it comes to issuing loans for Long-Term Residential Rental Properties, the distinction between jurisdictions lies in the definition of “residential” properties. While some States, such as Maryland, specifically exclude “non-owner occupied residential properties” or “rental properties” from the definition of “residential”, other States have broadened the definition of “residential” to include any property that is “used for residential purposes.” Even the definition of “used for residential purposes” can be open to interpretation based on the jurisdiction. For example, Virginia requires Mortgage Lenders that issue loans on rental residential properties to be licensed, because the State considers any 1-4 family property to be “used for residential purposes”, regardless of whether or not it is a rental property. Pennsylvania, on the other hand, considers 1-4 family rental properties to be “used for commercial purposes,” and therefore does not require those lenders to become licensed in through the State. Once it is determined that a license for Long –Term Rental Property Mortgage Lending is needed, the majority of States require the application be submitted through the NMLS. Many States require surety bonds, background checks, financial statements, and a number of additional supporting documentation. In addition to a company being licensed, most States require a lender to have at least one mortgage originator licensed in that State. Mortgage Lender licenses for Long-Term Residential Rental Properties can be complex and vary widely by jurisdiction. 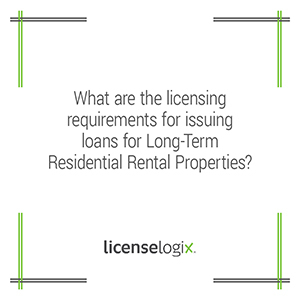 LicenseLogix will not only determine if licensing is necessary based on the types of loans that you issue, but can help you get and stay licensed! To get started, fill out the form on the bottom or give us a call at (800) 292-0909.